It is with heavy hearts we note the passing of Col. Robert D. Wilcox on April 2, 2017. At age 95, his was a life long and well lived. From October 1999 to August 2016, Col. Wilcox—himself a World War II veteran of the Air Force Reserve—preserved the memories, reflections, and eyewitness accounts of 201 veterans in his Salute to a Veteran column in 50plus LIFE. We honor Col. Wilcox for his service to country and community. We thank him for enriching the pages of 50plus LIFE and for his unwavering commitment to chronicling the selfless military service of the Greatest Generation, of which he himself was a part. He survived the Bataan Death March. He bombed the Bridge on the River Kwai. He escorted MacArthur ashore in the Philippines. Stories of ordinary men and women called to perform extraordinary military service. 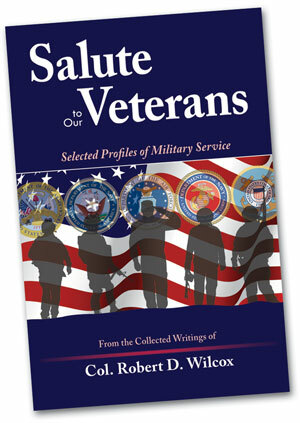 Since 1999, writer and World War II veteran Col. Robert D. Wilcox has preserved the firsthand wartime experiences of more than 200 veterans through Salute to a Veteran, his monthly column featured in 50plus LIFE. Now, for the first time, 50 of those stories—selected by Wilcox himself—are available to own in this soft-cover book. Sorry, but U.S. shipping addresses only. Thank you!